Note: Many of these error codes have an ‘Err’ prefix rather than an ‘E-‘ prefix on kilns made before Jan 2006. E- A (E-A, EA, ErA, Er A, or Error A) - is the result of having too high a number programmed into one or more of the segments of the Vary-Fire program you are trying to fire. E- 1 (E-1, Err1, E1, Er1) - Kiln temperature increasing slower than 12°F per hour when ramping for 22.5 min. E- 2 (E-2, Err2, E2, Er2) - Kiln temperature 50°F above hold temperature (18 seconds). If this a cooling segment, try using a cooling rate of 400°F or 500°F rather than one that is faster. Loose and overheated TC connections/ wires or old thermocouples can cause this too. Sometimes happens on an empty kiln during a first test firing. E- 3 (E-3, Err3, E3, Er3) - Kiln temperature 50°F below hold temperature (18 seconds). Pretty rare. Usually seen if heat treating metal and adding or removing parts at a higher temp (heat-treaters typically will turn the error codes off). Extremely uneven loading or something touching a thermocouple could cause it. Make sure your shelves are not blocking heat transfer between the zones (stagger shelves if you can). Usually E- 1 will appear first from a slow firing kiln as the kiln will slow itself and not move into the hold until all the thermocouples are reasonably close to the hold temp. Loose or overheated thermocouple connections/ wires or old thermocouples can cause this too. Can also be caused by programming a ramp rate that is too fast for the capacity of the kiln. Check to make sure relays are connected to the proper outputs. Check that thermocouples are connected to the proper inputs. E- 4 (E-4, Err4, E4, Er4) - Kiln temperature 50°F above previous hold when ramping down (18 seconds). Try using a cooling rate of 400°F or 500°F rather than one that is faster. 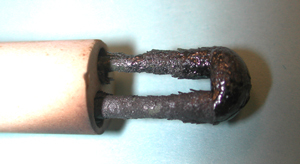 Loose and overheated thermocouple connections/ wires or old thermocouples can cause this too. E- 5 (E-5, Err5, E5, Er5) - Kiln temperature 50°F below traveling set point when ramping down (18 seconds). Pretty rare. Loose or overheated thermocouple connections/ wires or old thermocouples may cause this. E- 20 (E-20, E20, Er20): did not receive lock on Clock Generator Module- try again or replace board. E- 21 (E-21, E21, Er21): on-chip a2d (analog to digital) not responding/problem- try again or replace board. E- 22 (E-22, E22, Er22): off-chip a2d (analog to digital) not responding/problem- same as E- 6 on boards made after Jan 2006. With the display saying IDLE press 1,2,3 to see which thermocouple is reading oddly- really low or a negative number. Check thermocouple wires at their connection points to be sure that red is going to “-“ and yellow to “+”. If all seems well, the problem is probably that the thermocouple itself is flipped over/ reversed in the thermocouple connection block. Just pull the thermocouple out of the kiln wall and remove it from the thermocouple connection block, flip it over, reconnect it to the thermocouple connection block and re-install it in the kiln wall. 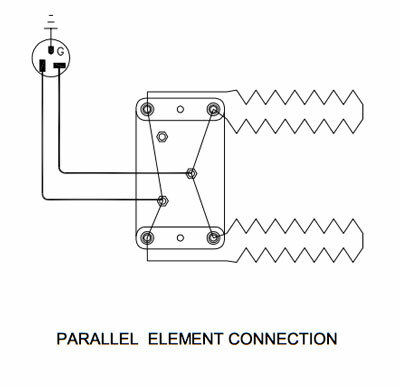 See this link for thermocouple polarity. E- 23 (E-23, E23, Er23): SPI not responding/problem- try again or replace board. E- 24 (E-24, E24, Er24): EE access while in write cycle- try again or replace board. E- 25 (E-25, Er25, E25): a2d (analog to digital conversion) not responding during power up- try again or replace board. E- 26 (E-26, Er26, E26): a2d (analog to digital conversion) not working properly/problem- try again or replace the board. E-bd (Erbd): Bad board temperature. It usually will read very high- like 300°F at room temp (From IDLE press OTHER again and again until it says “bdT”, press ENTER to see the board temp). This may mean that there is too much heat in your kiln room on near the kiln. Try cooling off the panel with a small fan or getting more ventilation in the room. Try firing again. Sometimes this is an indication of a bad board that needs to be replaced (especially if it is obvious that the board temperature is not that hot.) Note that there is an "alarm" setting for this (factory set for 250°F). This can be changed as one of the settings in the "hidden menu". E- /: division by zero detected- try again or replace board. E- - (Err-): power loss during EE write- try again or replace board. E- R (E-R, ErrR, ER): ram and EE do not match- try again or replace board. E- A (E-A, ErrA, EA): invalid program variable- try again or replace board. E- 0 (E-0, Err0, E0): software error- try again or replace board. E- 8 (E-8, Err8, E8): if cone fire temperature decreasing in last segment- a relay or an element has just failed. Loose or overheated power wires or connections and/or thermocouple connections or wires or old thermocouples can cause this too. Basically something has happened that stopped the power getting to one or more of the sections at the end of the firing. E- 9 (E-9, Err9, E9): wrong thermocouple hardware/software setting- rarely the board, only on ones made after Jan- ’06. Means the thermocouple circuit type (S or K), the S or K jumper setting on the back of the board, and/or the internal menu S or K setting do not all match. Start with the thermocouple circuit; wires and thermocouples must match, so determine whether are they S or K. Then check the S or K jumper setting on the back of the board. (Located approx center of the board under the marking “R97”. The tiny black plastic coated jumper only touching one of the prongs it is set to K. If it's touching both prongs it is set to S). Be sure the jumper setting matches the type of thermocouples they have. Then check the setting in the menu (from IDLE press OTHER/ 4/ 4/ 3/ then OTHER again and again until it reads TYPE. Press ENTER and any number key will toggle it from K to S to K, set it to the Type of thermocouple they have and press ENTER. Try running it again- still E- 9, replace the board (this is rare to have to do). See this link for a photo and more. FAIL alternating with TC1, TC2 or TC3: Generally this is a failed thermocouple. The TC+ a number indicates which position (TC1=top, TC2=middle and TC3= bottom zone). If the code is a solid E- P, ErrP, or PF it means a longer power outage, that the program is off and kiln is cooling- restarting is usually OK except in complex multiple ramp programs. If it is a flashing E- P, ErrP, or PF it means the program is still running and that the power was just off for a few seconds. If the power interruption is brief, the kiln will continue to fire when power is restored; in this case, there will be no indication of a power failure. Press ENTER to clear the error code. PF, E- P (E-P), ErrP: error in the power supply. tC-- : The red and yellow thermocouple extension wires are reversed. L7KH (or something that looks like that): This is not an error code. It is the software version in the control. It will flash briefly on the screen when you first turn the control on. STUC (stuck) indicates a key is not releasing. The outputs are turned off and stop the firing if in progress. It can be caused by moisture or stretched plastic from age or possible air bubble under the overlay. Sometimes heating gently with a hair dryer will remove the problem temporarily. ROR - Not an error code. This just stands for Rate of Rise. You might see this in conjunction with a E-1 error code. Can you restart the kiln after an error code? What is the worse that can happen after starting up from an error code? Look for the nameplate data. Plug the amperage and voltage labeled here into Ohm's Law to see what the resistance for the whole kiln should be. If the nameplate is missing you can email the factory to try and figure out what model it is. Measure the inside dimensions of the kiln, take whatever resistance readings you can, let us know whether it has Hi-Med-Low switches on infinite type switches and describe anything else you can about the kiln. An emailed digital picture can be very helpful. Measure the resistance of each branch circuit. Turn the switches OFF. The switches must be off or the meter will read all the branch circuits at once. Measure branch circuit resistance with the kiln power OFF from the two flat prongs (not the ground) of the plug-heads of each kiln section. On other kilns you want to determine how many elements are in each circuit and how the elements in each circuit connect together and to each circuit's power wires. Take the branch circuit resistance reading at the point where the power wires connect to the element(s). Determine series or parallel. 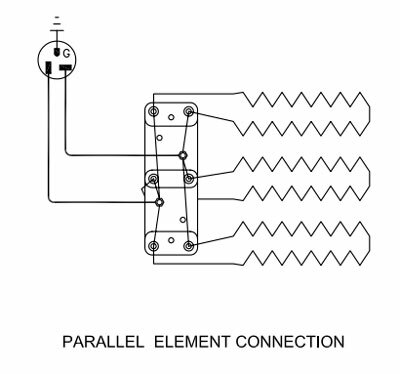 Look to see if the elements are wired in series or in parallel with each other. Even in L&L's latest kilns you would still have to either take the element box off or look at the kiln's wiring diagram to determine this. 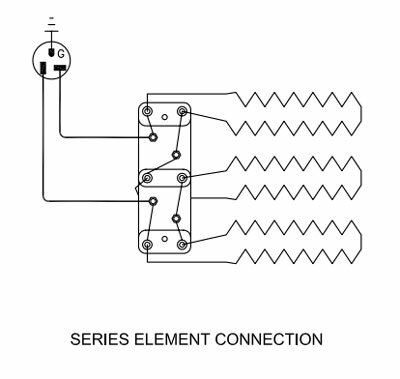 Check individual element resistance. Try to get a single element's resistance reading by either calculating it if they are in parallel or by measuring it with the meter if they are in series. You may need to disconnect wires to isolate as much as possible of each element. Take a voltage reading in each branch circuit at either the element connection to the power wires or at the control box receptacles on later L&Ls. Measure the voltage at the main power supply. If there is a considerable voltage drop from the main power supply to the element connection to the power wires then there is a corrosion or connection problem. 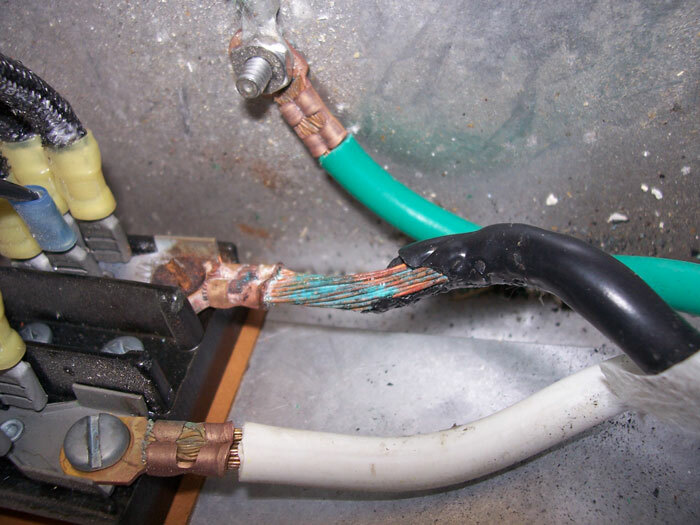 Badly corroded connections need to be replaced immediately. Both parts of the connection should be replaced at the same time. Check your plug and receptacle connections, especially the main power cord and receptacle. If the measured resistance is slightly more than 9% over the calculated resistance and this correlates with the problem (slow kiln), you should ideally replace all the elements, or at least those with readings that are too high. If you do not replace them all at once the kiln may heat unevenly (this is much less of problem with kilns having the zoned design with ungraded elements rather than with kilns that have graded elements. If all of the element resistances are fine but the resistance of the whole kiln is not, the problem must be in a branch circuit. With the kiln on, run a voltage test on the receptacles or at the connections to each element in each branch circuit to see which is the bad one. With the power off, open the control panel and visually inspect the branch circuits. Check branch fuses if the kiln has them. Locate the two wires that begin the bad branch circuit from the bunch that come from L1 and L2 on the main power block. Follow those wires to where they connect to the first component in line, probably either a fuse block, a relay or a switch. With the power ON, and any kiln-sitters or switches on High (so that the elements would come on if they could), take a voltage reading at the point where these two wires connect to the first component in line. The reading normally should be the same as what it is at the main power block. If it is not, one of the wires between the main power block and the first component is bad and needs to be replaced. 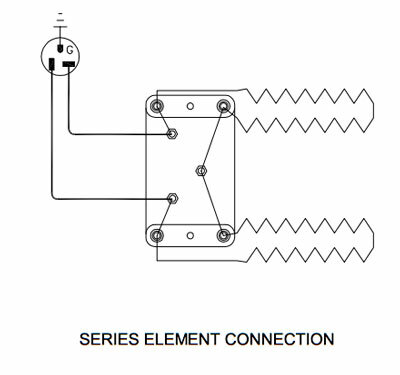 If there is voltage there then take another reading after the first component at the point where the two wires continue onto the next component or to the element connection. If there is voltage after the component then the component is working. To determine whether the contactor or the switch is bad, first follow the wires from the load side of the switch to the contactor. With the power all on and the switch on high, take a voltage reading where the two wires from the switch to the contactor connect to the contactor. If these readings are the same, then the contactor is bad. If there is no voltage present, then follow those two wires back up to the load side of the switch and measure the voltage there. If the voltage readings are the same, then the contactor is bad. If there is no voltage present, then follow those two wires back up to the load side of the switch and measure the voltage there. If the voltage reading is the same, then one of the wires is bad. If there is no voltage present at the load side of the switch (power all on, switch on high, then be sure voltage is coming to the switch; if it is, then the switch is bad. Replace the switch and if the problem still persists then repeat the test; you will most likely have to replace the contactor as well. If there is no voltage after the first component in line and it is not a relay/contactor, then just replace it. If it is a fuse holder, just replace the fuse (usually a bad fuse means there is a short somewhere in the circuit). Use a "continuity" tester to test for bad fuses. Always check tightness of connections in a questionable circuit. If there is voltage after the first component then move along the circuit from the main power block towards the element connections, testing for voltage before and after every component until you isolate the problem. Voltage readings taken from between the elements (and from between resistors in general) give a reading that reflects voltage which is half the supply voltage with two elements in series, and either one-third or two-thirds the supply voltage with three elements in series (depending on which side of the middle element in the series the test lead is placed). Start watching cones near the end of firing. Keep checking the control display to make sure it does not say CPLt. If the middle cones did not go down together then immediately note the differences in each thermocouple reading from the one thermocouple the same zone as the first cone that went down. Change the final set point of your program to reflect the difference. If the kiln is firing too hot then lower the final set point. If the kiln shut itself off before bending the cones properly, reprogram it and then restart it as quickly as possible. Record the temperature at which the kiln shut down. Stop and restart the kiln. Reprogram the same program to one cone number higher. Do these steps quickly. Watch the middle cones again and note at what temperature the cones properly bend. If they bent while you were programming then just offset the temperature by 5 or 6 degrees. Shut the kiln off once you note that temperature.